As spring's easterly winds die down (at least for now), what is likely the last of the wave of boats to reach US shores is rolling in. Despite a Memorial Day Weekend with relatively calm weather, 3 boats were found on Washington beaches, as well as one boat in Oregon (by me!). Another boat has been reported south of Waldport, Oregon but has yet to be located. 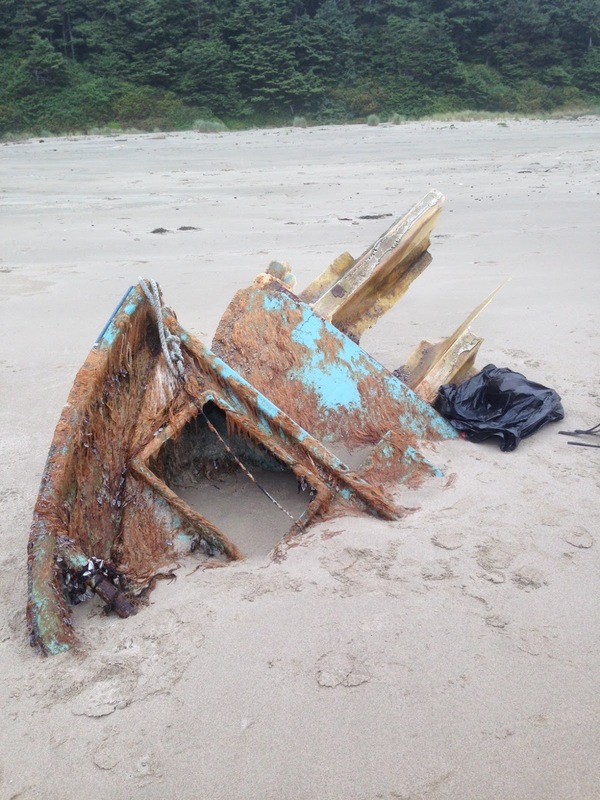 The first of the three Washington boats was found near Ocean Park on May 23, and was approximately 20 feet long. It included mainly Lepas antifera, pelagic gooseneck barnacles. Next, 2 more boats were sighted on May 24 in the Long Beach Washington area near Seaview Beach and Bolstad Beaches by Washington State Parks Recreation Commission Long Beach Area manager Tom Benenati. Benenati helped with sampling the boat and coordinated the removal of them from the beach, where they will await identification and communication from the Japanese Consulate. Lastly, my discovery on May 26 (Monday) is evidence that you never know what you are going to find on the beach! I had journeyed down the South Trail at Cape Lookout with my boyfriend and spotted the partial bow of a boat about 1/2 a mile up the beach. Evidence that preparedness is everything, I of course had no proper camera or bags for collecting samples of any sort. Working against the impending rain storm, we removed a few of the ~20 mussels from the boat and snapped some photos with my iPhone. I am sorry to say that I of all people was not more prepared for this one! 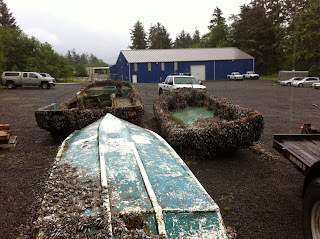 The boat was only a partial deck (the bow end) with a rectangular hold containing a few clumps of mussels, bristly hydroids, and the remains of some very sad-looking gooseneck barnacles- the boat had likely been sitting for a duration of several days. This brings our boat total since April 23, 2014 up to 25 vessels! This number is a reminder that we should really appreciate all of the parks employees, ODFW/WDFW employees, scientists, non-profits, and volunteers for the tremendous amount of work that they have put in the last 2 years. Many folks have devoted a lot of their time quickly responding to, cleaning up, and studying the tsunami debris that has reached our shores. Keep up the good, and very important work that is keeping our beaches clean and safe! The moral of the story is, it never hurts to bring the basic beachcombing essentials with you on the beach- gloves, bags, and a camera.